I admit that it's still difficult to adjust to being the editor of my own site and realizing that the writing schedule is completely within your control. After years of writing about various matches, I've tried to give myself more leeway when the Portland Timbers travel on the road by limiting my live stream and watching the match as a fan. It has worked so far with the Timbers traveling to Los Angeles and Columbus with me watching from the comfort of my couch, but the match on April 8 versus the Philadelphia Union provided a different experience. One of my dear friends, Travis, had invited friends and family to meet up with him at Cider Riot in SE Portland and watch the Timbers match before he starts a travel odyssey for the next year. Since I know the owner fairly well (we did play soccer together for Cascade Rangers FC - formerly known as Timbers Army Football Club back in the day) and I hadn't seen the pub yet up close, it was a great chance to get out and be social. The crowd was definitely pro-Timbers in the pub and it was great to catch up with several old friends before Portland faced off against one of the worst teams in the MLS Eastern Conference in the Union. While C.J. Sapong has been a decent goal scorer for the club early, he's not gotten much help from a midfield that has been struggling to adjust to each other. 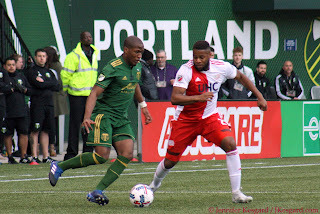 The defense has been even more scattered, putting pressure on the organization to find a way to right the ship, and the Timbers provided a unique challenge. While the Timbers have been getting lots of talk in the early part of the 2017 MLS season with their revamped offense and steadily improving defense, the Timbers had never secured a point while playing the Union in Pennsylvania. As a matter of fact in the 3 games played at the Union's home stadium, the Timbers hadn't even scored a goal there - although they earned 2 points off scoreless draws. 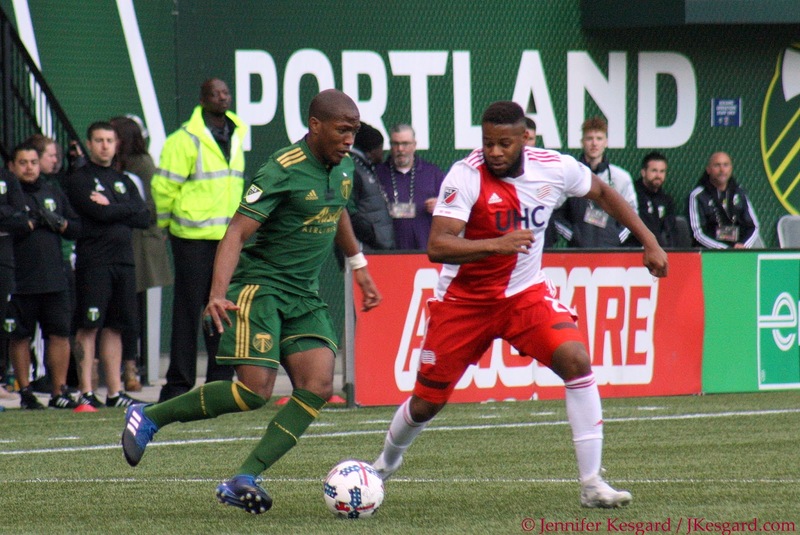 Portland had to feel some confidence in having all of their main weapons at the ready, but the Timbers couldn't look past the Union despite the disparity in records or performance. As Jennifer and I settled in with a cider taster tray to consume, it was apparent Philadelphia came out to play as they showed early promise with two chances to test Jake Gleeson. While Jake was able to make some early saves, he wasn't able to deal with a header from Union defender Richie Marquez off a corner kick and the Union took a 1 to 0 lead - the first time the Timbers conceded the first goal on the road. This could have been danger, but 6 minutes later, the shot heard around the world courtesy of Darlington Nagbe leveled the score and gave the visitors confidence. This event seemed to settle down the visitors, and Portland was able to add 2 more goals in the second half - one courtesy of Roy Miller off a corner kick and the second from a converted penalty by Fanendo Adi - to secure a 3 to 1 win. 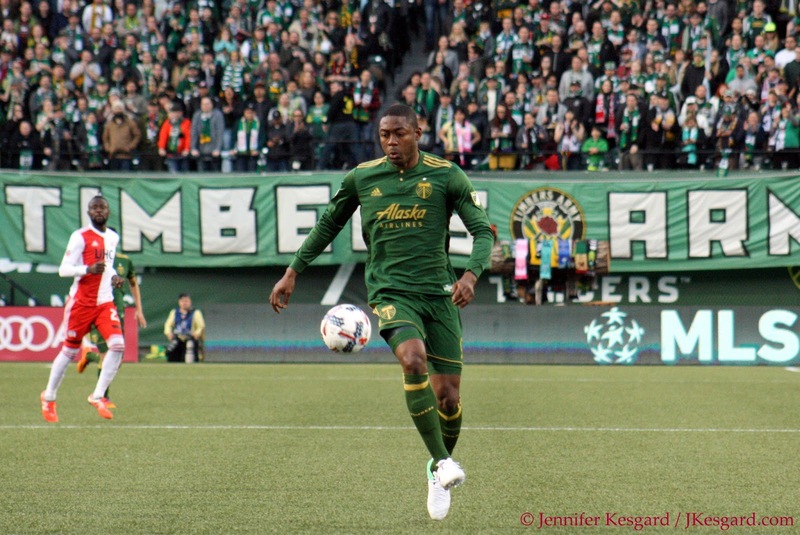 While some talk was centered around Adi becoming the all time, all-era overall leader in goals scored with 46 tallies and others chatted about the Timbers equaling their road points earned in 2016 for the whole season in just 3 matches in 2017, plenty of conversation was centered on Nagbe's turn and shoot goal that put him in elite company. With his 32nd minute goal, Nagbe became the first Timbers player ever to score in 7 different seasons with the club. Three Things I Liked: (1) Darlington Nagbe came up big, and his celebration was awesome. I've wanted Nagbe to show some killer instinct and be selfish at points in his career, and his goal showed that streak - taking a drop pass from Adi and putting it where the Union couldn't deal with it. His celebration was even better, as I judged it to be more of a "Did You See What I Just Did?" moment. (2) The Timbers appear to have cured their road woes. 6 points off draws in 2016 on the road with no wins; in 2017 in just 3 matches, the Timbers have 2 wins in impressive fashion and a hard fought loss in Columbus for 6 points. Whatever changes Caleb Porter has made in their road approach has paid dividends. (3) The makeshift defense has been playing really well. Portland was counting upon Liam Ridgewell and Gbenga Arokoyo to be their center back duo for 2017, but Arokoyo's season ending injury and Ridgewell's calf strain have kept Roy Miller and Lawrence Olum in the rotation. Not only have they done well, but they've been supported by Alvas Powell, Vytas, Marco Farfan and Zarek Valentin well. Three Things I Didn't Like: (1) Will we see more of this from Darlington Nagbe? Nagbe is now in elite company in the Timbers' history books, but of his 7 seasons in Portland, he's scored just 1 goal in 3 of them. The offense is good with him, but it could be elite if he can add to his account on a regular basis. (2) The sluggish start was troublesome. 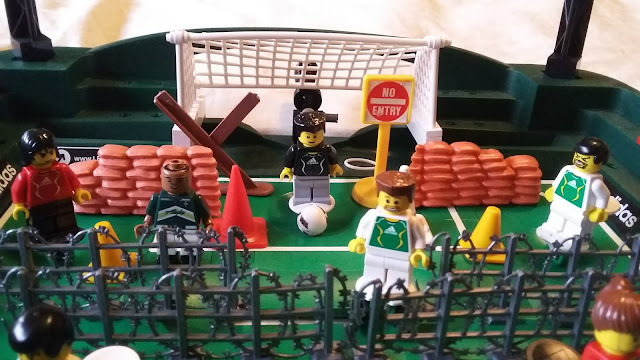 Thankfully, the Timbers overcame it with some impressive second half work, but my hope is the team avoids getting into these holes in the first place. (3) Can the defense keep it up? The group has been better than advertised so far, but Portland now gets these teams in succession - Sporting Kansas City, Vancouver, FC Dallas, San Jose, Atlanta, Montreal and Seattle. There are some potent offenses in this group, so the Timbers backline will need to keep up the form. Congratulations to you for setting Timbers history. Jake Gleeson - 7: Good saves, no glaring mistakes. Marco Farfan - 7: Steady, heady effort from the youngster. Lawrence Olum - 6: The veteran continues to play well and hold up under pressure. Roy Miller - 8: Solid defense and a goal for his effort. He's been much better than expected, and I think it's been a life saver for this Timbers defense that needs a leader with Ridgy out. Alvas Powell - 7. Alvas had one of his better efforts of the year. No mistakes and some solid tackles all evening, the Union weren't able to get much going on his side of the pitch. Diego Chara - 6: Chara was much better in this match and held his own in the midfield. David Guzman - 7: The midfield ran smoother and I think it was due to Guzman being his ball hawking, distributing self after the initial start. Darlington Nagbe - 7: Please to keep scoring, thank you. You make this team better when you score regularly to put a threat on the wing. Diego Valeri - 7: Distributing and visionary, it was unusual not to see Diego join the scoring sheet, but he did earn an assist and started several great runs. Sebastian Blanco - 6: Kept the Union honest out wide for the afternoon, which helped open things up for the rest of the team. Fanendo Adi - 8: He made history by becoming the all time leading goal scorer in Timbers history for all eras, but he was dangerous all day. I love seeing him in form. Darren Mattocks - 5 (Subbed for Blanco in 70th): Great to see Darren late in the match as change of pace. Hopefully the injury that pulled him from the match isn't long term. Amobi Okugo - 5 (Subbed for Valeri in 81st): With Ben Zemanski dealing with injuries, he's the cover in the defensive midfield for now and he played well in a short run. Jack Barmby - 5 (Subbed for Adi in 2nd half stoppage): He helped run out the match. Philadelphia - 3: Started well and fell apart late. This team is a mess. 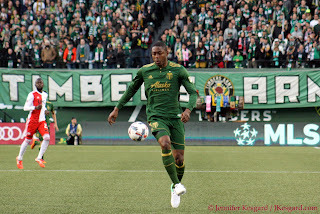 Timbers - 7: Started slow, but got better and showed off some prowess.